RIP (Routing Information Protocol) is one of the oldest distance vector routing protocols. It is usually used on small networks because it is very simple to configure and maintain, but lacks some advanced features of routing protocols like OSPF or EIGRP. Two versions of the protocol exists: version 1 and version 2. Both versions use hop count as a metric and have the administrative distance of 120. RIP version 2 is capable of advertising subnet masks and uses multicast to send routing updates, while version 1 doesn’t advertise subnet masks and uses broadcast for updates. Version 2 is backwards compatible with version 1. RIPv2 sends the entire routing table every 30 seconds, which can consume a lot of bandwidth. RIPv2 uses multicast address of 224.0.0.9 to send routing updates, supports authentication and triggered updates (updates that are sent when a change in the network occurs). For example of how RIP works, consider the following figure. 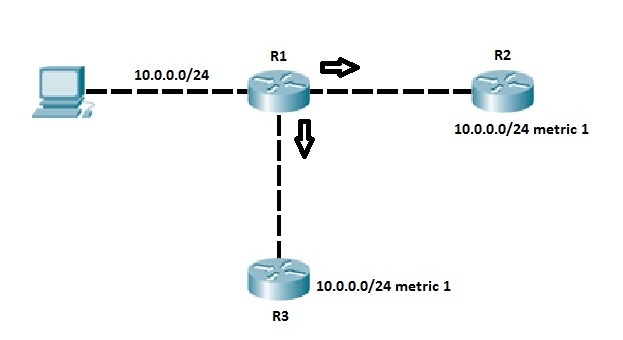 Router R1 directly connects to the subnet 10.0.0.0/24. Network engineer has configured RIP on R1 to advertise the route to this subnet. R1 sends routing updates to R2 and R3. The routing updates list the subnet, subnet mask and metric for this route. Each router, R2 and R3, receives this update and adds the route to their respective routing tables. Both routers list the metric of 1 because the network is only one hop away. Maximum hop count for a RIP route is 15. Any route with a higher hop count is considered to be unreachable.